Nice, straightforward talk by Professor Henry (Hank) Chesbrough today on Opensourceway.com. (For audio recording please see: Open Services Innovation – Chesbrough). The talk was based on his new book Open Services Innovation. Professor Gary Hamel was also present on the audio call talk. Chesbrough explained his new research and ideas that build on the idea of open services innovation rather than just product innovation. He began with some basics about what is innovation, and open innovation by explaining how nobody has a monopoly on great and new ideas, and how companies need to make more use of the ideas of others. He called for companies to liberate the material and ideas that are held internally with the rest of the world (so long as they are not your core competence, of course). If many companies followed such a model of sharing then we would see more innovation. Using the example of drug discovery he showed how the same discovery can help lead to the cure of more than one disease. The larger problem here, he acknowledged was that companies and management are built to have an implicit logic of NOT sharing as internal promotion systems etc are all tightly linked to ideas of keeping information to yourself and not sharing. There is active discouragement of sharing. Such a mindset and internal structures do not allow companies to change. Linking the idea of holding on to the status quo and non-sharing, Chesbrough brought the argument around to the big problem he sees in product innovation – It is limiting, or as he puts it, companies fall into the ‘commodity trap’. Commodity trap simply means that organizations become dependent on merely innovating the product internally. You are thus only as good as your next product. But what makes it harder to sustain differentiation and success is that you can only rely on internal ideas and innovation, and that too in the products area (limited to the design of your last product and how you will you upgrade it etc…. 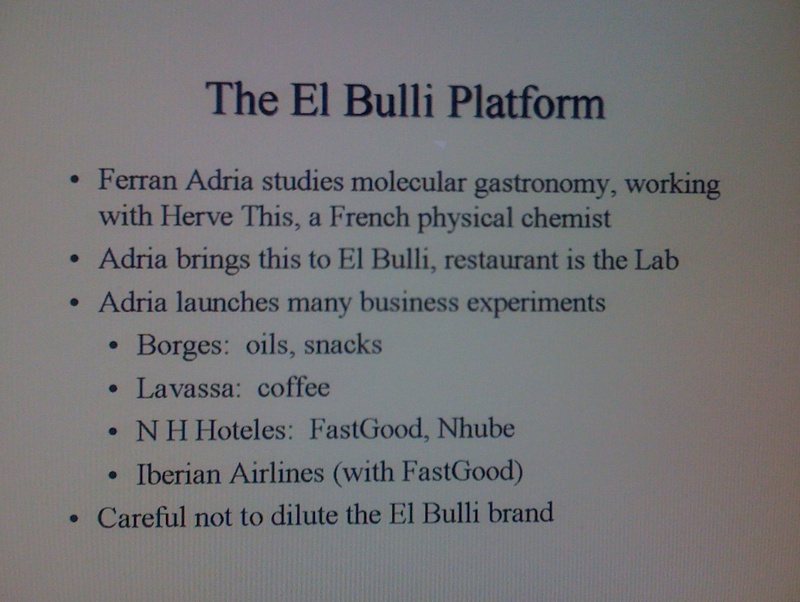 but also new products in a similar area). On the other hand Chesbrough’s research has shown that companies like IBM indicate that more than half of their profit comes from services (this was back in 2004). 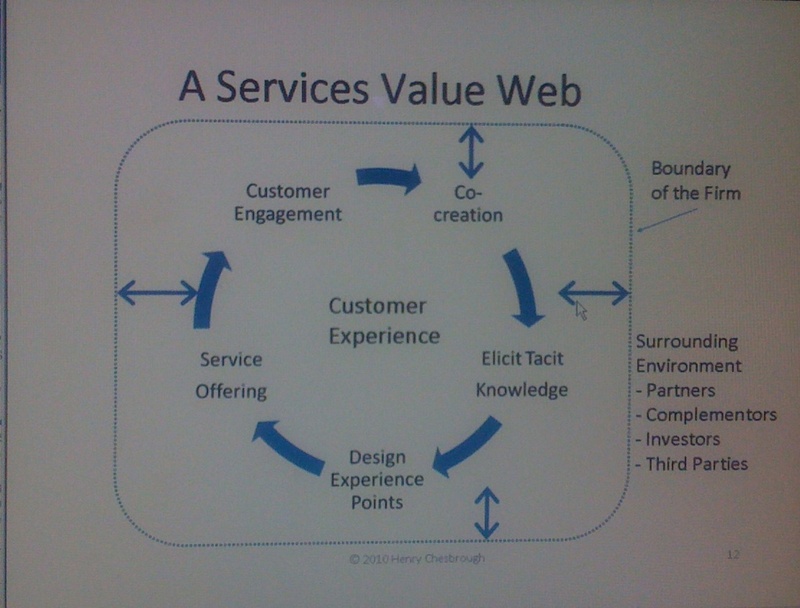 Why is this not matched with a focus on services innovation then? Clarifying his ideas, Chesbrough explains that products are not important in themselves – it is the service they deliver that a customer wants. For instance a drill makes holes and it is the hole that the customer wants and not the tool per se. 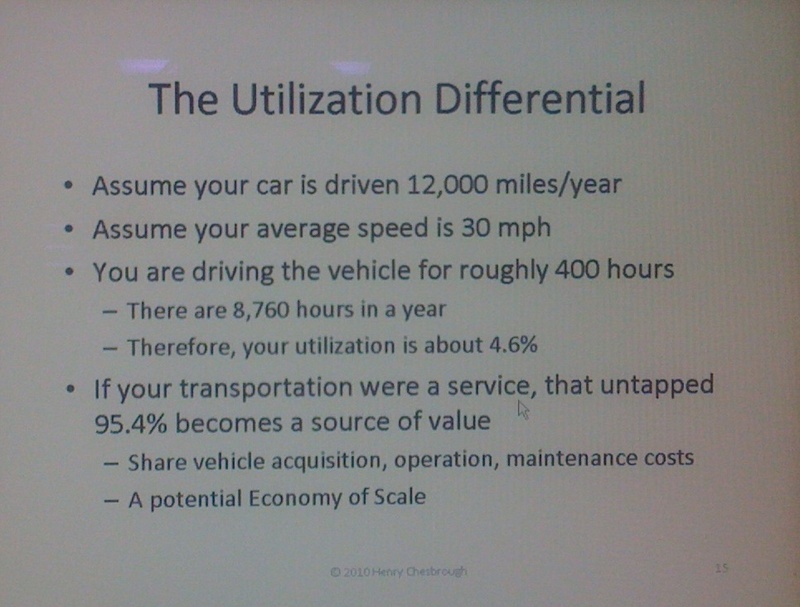 See his slide below on utilization differential. Open services innovation is one way to avoid the commodity trap. Open services innovation implies building deeper relationships with your customers so you can find other ways of adding value and working closer with each other. 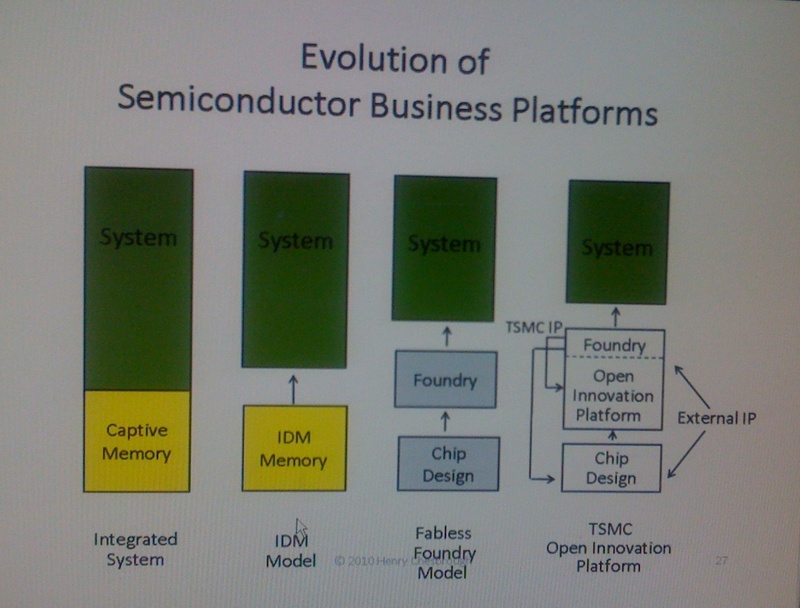 He provides three different examples (from various industries to prove that his model does not only apply to technology – Amazon, El Bulli, and TSMC). Opening up your backend infrastructure leads to more innovation. Q: How does open services innovation avoid the commodity trap? Chesbrough: Open source business models allow for collaboration at one level and then competition higher up in the stack, the same is true for open services innovation. Q: If I am in a traditional entrenched Fortune 500 company what do I do to make a change of such a drastic nature in my organization? Chesbrough: Rethinking management in fundamental ways is never easy. You could start with an experiment that you can control. Look to your customers for inspiration and observe how they use your products. Q: How do I retrain my boss to exhibit values of open innovation? Chesbrough: I feel the commodity trap example helps to dissuade managers from becoming too entrenched. Q: How does one use the lessons of open innovation and translate them to social innovation? 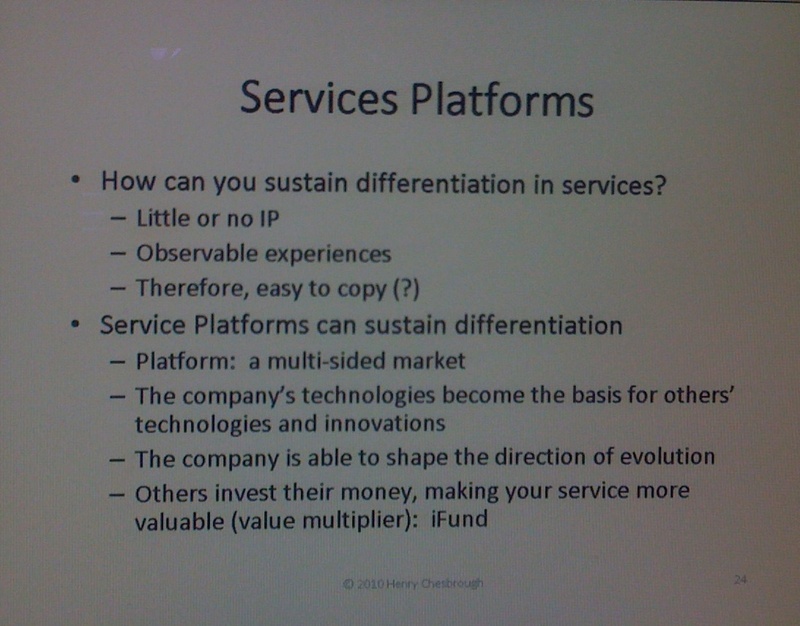 Chesbrough: Use the platform to innovate with ideas, as you would for products and services. Professor Gary Hamel asks Professor Chesbrough: Platforms are competing with each other like Apple versus Android (Google)? You say there is no longer a first mover advantage? So where is the advantage? Chesbrough: We are not beyond competition. It is clearly not a first mover issue these days but companies can gain by building a more robust and faster working network.